For the former local government district, see County Borough of Teesside. 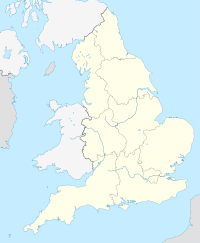 Teesside (/ˈtiːsaɪd/) is the conurbation in the north east of England around the urban centre of Middlesbrough that is primarily made up of the towns Billingham, Redcar, Stockton-on-Tees, Thornaby and surrounding settlements near the River Tees. It was the name of a local government district between 1968 and 1974—the County Borough of Teesside. Teesside remains an important centre for heavy industry, although the number of people employed has declined. Traditional industries, primarily steelmaking (British Steel) and chemical manufacture (Imperial Chemical Industries (ICI)), have been replaced to a large extent by high technology activities, science development and service sector roles. In 1974 the County Borough of Teesside was absorbed into the larger non-metropolitan county of Cleveland along with the towns of Hartlepool and Guisborough. The Teesside area was partitioned between the boroughs of Stockton-on-Tees, Middlesbrough and Langbaurgh, with the wards of Billingham East & West, Grangefield, Hartburn, Mile House, North End, Norton, Stockton South, Thornaby East & West going to Stockton; the wards of Coatham, Eston Grange, Kirkleatham, Ormesby, Redcar and South Bank going to Langbaurgh; and the rest going to Middlesbrough. Local government reorganisation in 1996, recommended by the Banham Review, saw the county of Cleveland broken up into the four independent unitary authority boroughs of Hartlepool, Stockton, Middlesbrough and Redcar and Cleveland (a renamed Langbaurgh). At this time they were returned to the counties of North Yorkshire and County Durham for ceremonial purposes, with Stockton-on-Tees becoming the only district in England split between two ceremonial counties. In 1998 the neighbouring Borough of Darlington also became an independent unitary authority and this along with the four former Cleveland boroughs form the sub-region of the Tees Valley which is used for statistical purposes and governmental organisation. The name Tees Valley is increasingly promoted for economic and cultural connections, though Teesside, Cleveland, Yorkshire and Durham are frequently used, such as the continued existence of Cleveland Police and Cleveland Fire Brigade, and of the Cleveland postal county. Eaglescliffe and Yarm are counted as a separate Yarm urban area, separated by a narrow gap, which had a population of 19,184 according to the 2011 census up 5% from the 2001 figure of 18,335. Infilling development may join the two urban areas together. Marske-by-the-Sea is another separate Urban Area nearly contiguous with Redcar with a population of 8,282 down 7% from the 2001 figure of 8,921. Nearby Hartlepool is also sometimes considered as part of Teesside. The Hartlepool area has an urban population of 88,855 an increase of 3% from the 2001 figure of 86,085 and this can be referred to as the Teesside & Hartlepool Urban Area. If this definition is taken into consideration, with the addition of the Eaglescliffe area and Marske, Teesside would have a population of approximately 492,954 people. Teesside industry is dominated by the commodity and in many instances, integrated chemical producers of the Northeast of England Process Industry Cluster (NEPIC). These companies are based on three large chemical sites around the mouth of the River Tees at Wilton, Billingham and Seal Sands. These companies make products such as petrochemicals, commodity chemicals, fertilizers and polymers. Teesport is based on the River Tees and is currently the third largest port in the United Kingdom, and amongst the ten biggest in Western Europe. This port handles over 56 million tonnes of goods per annum which are mainly associated with the local petrochemical, chemical and steel processing industries. The port is an important piece of logistical infrastructure for the NEPIC cluster of process companies. TS postcode area which is officially known as the 'Cleveland postal area' by Royal Mail, but was clearly formed from Teesside. Teesside continues to be used as signed destination on UK road signs. It is only once the actual boroughs are entered that local town names are used. It has also been adopted for various other purposes as a synonym for the former county of Cleveland. It is common to see Teesside spelled incorrectly as "Teeside", with a single 's'. ^ a b c d "2011 Census – Built-up areas". ONS. Retrieved 1 July 2013. BBC Tees – the latest local news, sport, entertainment, features, faith, travel and weather.